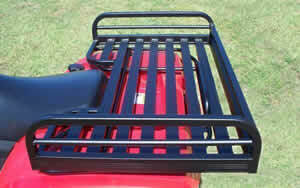 Any ATV can be improved to be more functional by adding a good rear rack. Great Day’s new Mighty-Lite Rear Rack is the ultimate rear rack for a four-wheelerit combines the incredible strength and light weight of aircraft aluminum with sleek, good looks and universal fitting. The Mighty-Lite fits most Honda, Polaris, Yamaha, Kawasaki, Arctic Cat and other brands of ATVs. Unlike steel mesh racks, the Might-Lite rack will never rust and will provide years of dependable service. The Might-Lite comes with an unheard of FIVE year warranty against defects in materials and workmanship! The Mighty-Lite provides a generous-sized cargo basket with its measurements of 41″: wide, 26″: deep and 7 inches deep. Weighing only 14 lbs, the MightyLite rack adds very little to the weight of the vehicle while providing an incredible hauling capacity. The Mighty-Lite installs with Great Day’s clever new accessory attachment hardware. It is finished with “hard as nails” powder-coat black enamel. The Mighty-Lite weighs only 15 lbs. and ships by UPS.